This winter I have fed my addiction to South Indian cuisine by plunging snow white, steamed cakes (known as idli) in spicy broths, like rasam and sambar. Entranced, I have observed how the simple patties, made of rice and lentils (or sometimes semolina), draw multi-layered flavors from the liquid, like sponges, and carry the perfect union of attraction and diversity into the mouth. There must be a genius mind behind such harmony and compatibility! I am astonished by how a couple of humble ingredients create such an interesting character, story and mood. Another favorite that has been a weekly fair in our home is dosa. Now that I think about it, rice and dal batter has been fermenting in a clay pot in a warm nook of our kitchen every fortnight; and, when I have run out of it, I have made an “instant” batter. Or, almost instant, because there are degrees of “immanency”, which I will explain later. Before that, let’s have a closer look at dosa! Whether paper-thin or a bit thicker, they look like crépes or pancakes but feature the crispiness of a wafer. They are usually made from urad dal (split, dehusked seeds of black gram, not to be confused with black lentils used in European – especially French – cuisine) and rice that are soaked and, then, ground into a fine paste and fermented in room temperature until the mixture expands and adapts a mildly sour temper. The process increases nutritional value and digestibility, which is necessary because urad dal is one of the heavier lentils containing a large amount of vegetarian protein. Sometimes mung dal is used instead of urad. There is also a variety of dosa made from wheat or semolina. In my upcoming book, there will be a recipe of both, the traditional urad dal dosa and the semolina one (rava dosa) which is especially fun to make: the batter is plastered onto a hot pan, by hand, as if it were wet cement! Of the pulses, mung dal is most suitable for all body types or humors; its’ chemical breakdown is faster and, thus, the nutrients are easily absorbed into a blood stream. It has a mild aroma in comparison to other beans. I have found it very good for dosa because it leaves a content but light feeling after eating. It can - but does not have to - be fermented which is helpful when you want to have a substantial but quick meal or snack: after soaking for thirty minutes, you can grind and use it. Of course, it is better if you have a hunch the day before and immerse the lentils and rice in water for overnight and ferment the batter for a day! But, in an emergency, you can safely use the shortcut and even substitute rice with rice flour. That’s the shortest definition of “instant”. 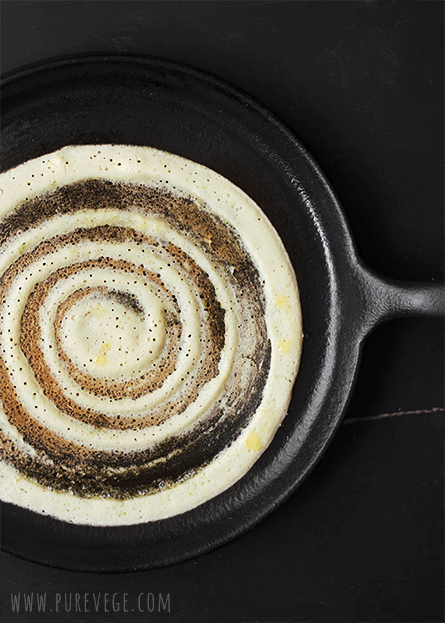 Unlike crépe batter, dosa batter is not poured onto a hot, buttered pan and spread by tilting; it is placed in the center of a dry pan and quickly distributed by doing a circular motion with a flat base of a ladle, leaving small ridges in a spiral. Ghee, butter or oil is sprinkled on the top and sides of the pancake during the frying. Like a charm, the crépe releases itself from the pan when it’s cooked. Usually, dosa is not flipped over but filled directly on the pan, and folded in half or rolled like a wrap, and served immediately with chutney, pickles or as a part of a larger meal. Potato curry is perhaps the most common way to stuff the pancakes; they go well with coconut chutney. But, I find dosa delicious with any other filling, too! Crépes that envelope fresh, savory cheese is one of our favorites. Sometimes, like the day I was photographing for this post, I crumbled them in a salad, like croutons, as an effort to incorporate energy into a low calorie lunch. For me, this type of side-dish is as creative as it gets, and provokes imagination. Ps. I forgot to mention in the recipe that it makes 10 to 15 pieces, depending on the size. As beautiful as it can get. I have never made dosa with mung. Have made Chilla - another kind of crepe with only mung. I must try this and see how it changes the flavors. Yes mung has enticing aroma. You are a genius ... You can also prepare such dosas with all dals mixed seasoned with raw jeera and fresh grated coconut. Thank you for giving us the name, pesarettu. I found that fermenting makes the consistency of the batter thicker and aerated. Also, it gives a mild sour tone which enhances the taste. Funny that you mention: I made yesterday mung and rice dosa with coconut, jeera, curry-leaves, hing and black pepper because I had a left over piece of coconut I wanted to get rid of it :-)! They were superb! Coconut gives a little bit texture which I don’t mind because they fry beautifully. That’s exactly my point: once you understand how something works, you can expand and twist the details according to time, place and circumstance. Oh Lakshmi, I am hungry now. I tried making dosa only once and failed miserably. Never tried again. I make something similar which is a Bengali crepe called shoru chakli made from rice and lentil. I'll take a picture and write a blog post on it. You inspired me. Beautiful fresh crisp dosas and pictures. While reading your comment, it occurred to me that maybe some of our kitchen disappointments are coming from expectations. I assume you (and many others) have eaten proper dosa in a restaurant, and what I’ve heard; they are somewhat finer and, perhaps, thinner than homemade ones. But such knowledge does not burden me because I’ve never experienced it! Neither my mother nor grandmother showed me how dosa should look like. “Ignorance is bliss” applies here, too, I guess! Coming from a different food tradition, I’m simply astonished that you can make so many things just by using rice and dal. To see a batter fermenting is a miracle to me! I just try to utilize it to the best of my capacity and relish it without worrying whether it meets international standards. Setting the bar too high makes cooking a stressful act, where it should be an expression of gratitude and love. Of course, quality is an important part of it, but not at the cost of consciousness. Even failures and imperfections are perfect when the mind is in a right place; when the mind is disturbed, even perfect things appear imperfect. I’m very interested in shoru chakli! I was just thinking what would be a Bengali version of dosa. Are they sometimes served with gur or syrup? Somehow I have an impression that there is such a dish? You are so true Lakshmi. If we set the bar too high, it's frustrating to reach there. I have never eaten dosa at home and never seen my Maa cook it. We used to get very good dosas in the restaurants in Calcutta. Mine were not just imperfect, they were inedible. I'll try again someday. just have to gather enough courage. I wish I could see things with your perspective. Your food looks so clean and fresh, just like your words and thoughts. they look just perfect, doesn't matter if they are of international standard or not. Yes, we do eat it with gur. We add fennel to it and it tastes very simple yet delicious. My husband prefers a savory version and my maa makes it with cilantro and green chilis. I'll make sure to document it next time. Lakshmi, I came across your blog through your Facebook page. Love your blog and your beautiful words. I am more of a dosa girl, however your description of idlis just made me fall in love with them. Sudha Neelam, welcome to the blog! Nothing short of amazing. Absolutely beautiful and delicious looking! Thank you! Don’t worry, Reem, about replying. Take your time. You already inspired me immensely! I needed a kick and you gave it to me, knowingly or unknowingly. Thank you. What stunning pictures and of course the recipe. We love dosas ( all kinds) and it is usually a dinner and not just breakfast or 'tiffin' with us. I love South Indian food and dosa tops the list. Love the idea of crumbling dosa on a salad like croutons. Your shots are beautiful and delicious as always. Upcoming book? Yay! I am always happy to see a new recipe blog post from you in my email inbox. I will try making dosa and update you on how they turn out. We first ate dosa at Hampton Chutney in New York City last year. The dosas were enormous. It was a vision to see them wrapped like a cone around the normal sized filling. Thanks, too, for mentioning idli. We eat a lot of Indian food in our home, but I don't think I've ever tried that! Yes, the book will come out next year! As a matter of fact, I should be revising the texts right now, instead of hanging out here :-)! I’ve also understood dosas are very large. I’m always amazed by the expertise Indians work with their hands. I’ve seen them make poories bigger than a football (without using a rolling pin). Recently someone posted a video clip on FB: a man was making flatbreads about the size of a tractor tire, again just by flipping and turning a ball of dough with his hands. Idlis are made of the same fermented (but thicker) batter as dosa. They are steamed on a layered stand until they rise and become like sponge cakes. Please let us know how your dosas turn out! your photos made me craving for one... we called this tissue thosai (or dosa) in Malaysia. Used to have this all the time when I was living there. OMG! I cant believe how neatly you have taken that photographs. As @Soma said, your photographs and wordings are completely distracting us from reading the topic. I haven't used mung dal in my dosa preparations. Always use urad with rice. Will give a try next time. Hi. I just want to know is it OK if I apply bean curd to this recipe. will it ruin the whole thing? Hi, unfortunately I'm not able to help you with your question. I don't use tofu and don't know how it would react.